Handcrafted fobs add an elegant touch to your scissors. Each fob is approximately 6" long and is crafted of a unique combination of beads and colors. We will try to accommodate your requested color scheme but cannot guarantee bead selection. If you have a "family of colors" preference, please indicate in the "Comments" section of your order. The perfect tool for "fluffing" yarns and threads. Metal brush head measures approx. 1 1/2" wide and 1/2" deep and 1/2" long. Large wooden laying tool with turned design handle top, approx. 6". Small and compact smooth wooden laying tool, approx. 4" in a variety of woods. A wooden laying tool attached to a metal wire bracelet. Laying tool is approx. 5 3/8" long. Bracelet is approx. 3 1/4" in diameter and is designed to slide to open for ease of placing over hand. Wooden holder perfect for holding 4" laying tool and needles. Small, compact metal laying tool, approx. 3 7/8" long. A handy set of 4 magnets, perfect for holding needles or scissors on canvas. Each magnet approx. 3/4" in diameter. Chrome plated fleur-de-lis embroidery scissors from Ginghar. Approx. 3 3/4" long, comes with protective sheath for blades. Small scissors perfect to stash when you're on the go or rest on magnets on your canvase, comes with storage sheath, approx. 2 5/8" long. The perfect scissor for removing stitches. The slanted tip helps you slide under the threads. Approx. 4 1/4" long. A faux lizzard case with snap closure and canvas insert, approx 4" long. STITCH BLADE This item is on sale. Surgical steel blade is razor - and I mean RAZOR! - sharp on the inner edge and dull on the outer edge. 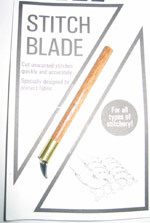 Quickly and accurately cuts one or many unwanted stitches without damaging underlying fabric. Pointed tip makes even the smallest stitches easy to remove. Great for all types of needlework. The inner edge of this blade is extremely sharp. This must be kept out of reach of children and pets and must be used with caution. This was purchased to replace the Stitch Fixer, previously listed on the website. A charming antique metal finished thread cutter pendant. Cutting edges are recessed in the edges of the pendant. Approx. 1 1/4" in diameter. A revolutionary idea in needles. Twin points with the eye in the middle allows for quick stitching with your floor or table top stands and frames. Stitch with one hand on top and one hand below the canvas. Stitch straight up and down through your canvas without turning your needle.